Along with killing DACA and limiting legal immigration, Trump also has Immigration and Customs Enforcement working harder than ever. Though total deportations fell in 2017, arrests of undocumented immigrants living in the U.S. surged. The majority of those arrested were first convicted or charged with a crime, though many of those crimes were low-level traffic offenses. Still, some were innocent of all but being in the country illegally. The number of non-criminal immigrants arrested in 2017 increased by 60 percent, up to 13,600 compared to 5,498 in 2016. These are the official statistics from ICE underscoring what has caused lower deportations than 2016 while internal enforcement operations have increased. 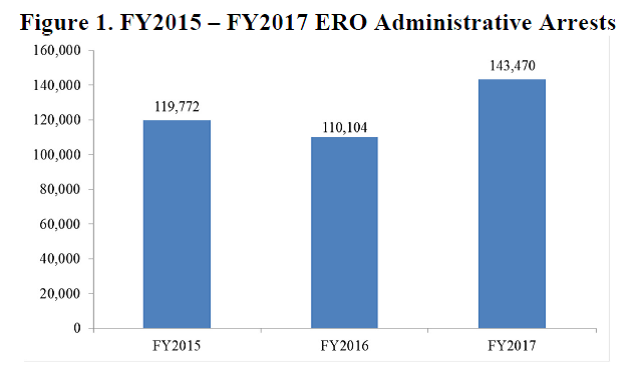 This report summarizes U.S. Immigration and Customs Enforcement (ICE) Enforcement and Removal Operations (ERO) activities in Fiscal Year (FY) 2017. As directed in the EO and implementation memorandum, ICE no longer exempts classes or categories of removable aliens from potential enforcement. 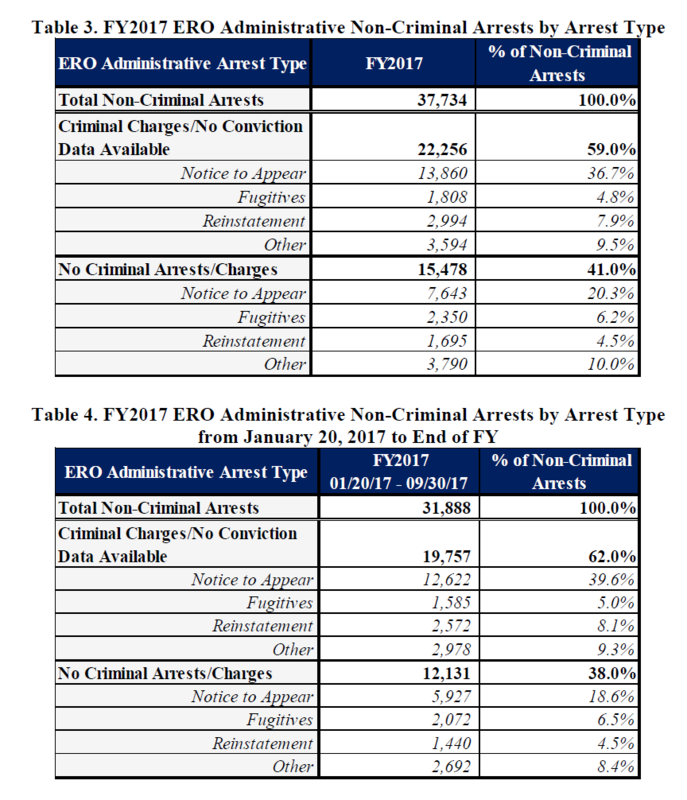 This policy change is reflected in ERO’s FY2017 enforcement statistics, which show increases in the following enforcement actions: (1) ICE ERO administrative arrests; (2) book-ins of aliens to ICE detention facilities resulting from ICE arrests; and (3) ICE ERO removals of aliens as a result of ICE’s interior enforcement. The trend of increased enforcement actions began shortly after the change in administration on January 20, 2017, and this date is used throughout the report for the purposes of data reporting. In each of the aforementioned areas, there was a net increase over the prior fiscal year. 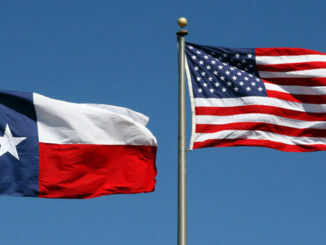 An administrative arrest is the arrest of an alien for a civil violation of the immigration laws, which is subsequently adjudicated by an immigration judge or through other administrative processes. 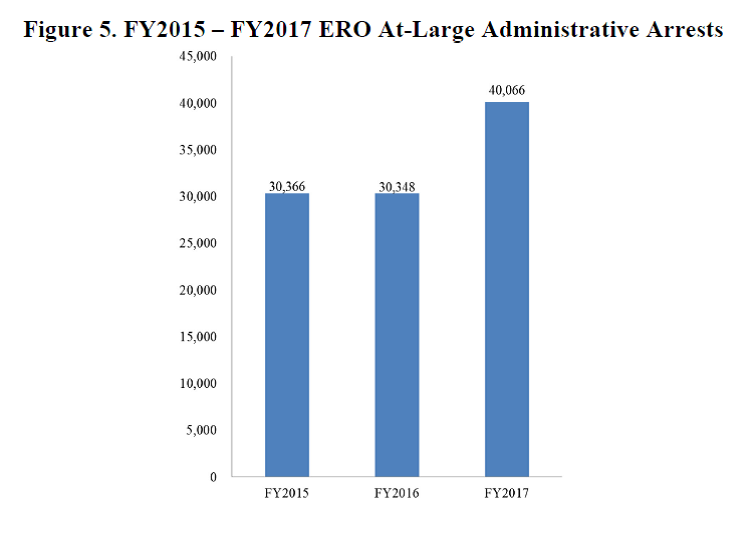 With 143,470 administrative arrests in FY2017, ICE ERO recorded its greatest number of administrative arrests as compared with the past three fiscal years.1 There were 33,366 more administrative arrests in FY2017 than in FY2016, representing a 30 percent increase, as seen in Figure 1. As of Sept. 9, three weeks before the end of the 2017 fiscal year, ICE had deported 211,068 immigrants, according to the most recent figures provided by the agency. ICE removed 240,255 people during the government’s 2016 fiscal year. The lower totals are not for lack of effort. According to ICE, its agents have made 43 percent more arrests since Trump took office versus the same period last year. The lower totals are not for lack of effort. According to ICE, its agents have made 43 percent more arrests since Trump took office versus the same period last year. While ICE took into custody more immigrants with criminal records, the fastest-growing category of arrests since Trump’s inauguration is those facing no criminal charges. The agency arrested more than 28,000 “non-criminal immigration violators” between Jan. 22 and Sept. 2, according to the agency’s records, a nearly threefold increase over the same period in 2016. An ERO at-large arrest is conducted in the community, as opposed to in a custodial setting such as a prison or jail. The total number of at-large arrests increased after the EO was issued, particularly in those areas that do not honor ICE detainers or limit or restrict ICE’s access to their jail population. Figure 5 shows that total at-large arrests in FY2017 increased to 40,066 from 30,348 in FY2016. A detainer is a request that the receiving law enforcement agency both notify DHS as early as practicable, at least 48 hours, if possible, before a removable alien is released from criminal custody, and also maintain custody of the alien for a period not to exceed 48 hours beyond the time the alien would otherwise have been released to allow DHS to assume custody for removal purposes. ICE issues detainers to federal, state, and local law enforcement agencies only after establishing probable cause to believe that the subject is an alien who is removable from the United States and to provide notice of ICE’s intent to assume custody of a subject detained in that law enforcement agency’s custody. The detainer facilitates the custodial transfer of an alien to ICE from another law enforcement agency. This process helps avoid the potential risk of danger to ICE officers and to the general public by allowing arrests to be made in a controlled, custodial setting as opposed to at-large arrests in the community. 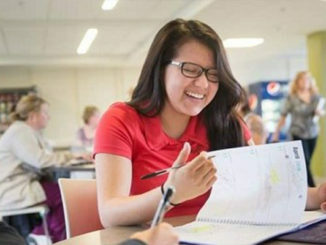 Although not legally required, as a matter of policy, all detainers issued by ICE must be accompanied by either: (1) a properly completed Form I-200 (Warrant Criminality for Arrest of Alien) signed by a legally authorized immigration officer; or (2) a properly completed Form I-205 (Warrant of Removal/Deportation) signed by a legally authorized immigration officer. ICE records a detainer has declined when a law enforcement agency fails to maintain custody of an alien for up to 48 hours, as requested on Form I-247A (Immigration Detainer – Notice of Action), and instead releases the alien into the community. 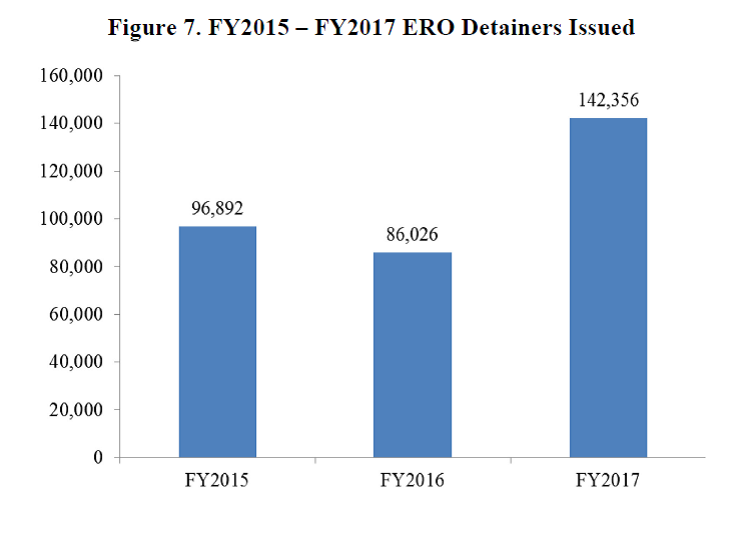 In FY2017, law enforcement agencies declined 8,170 ERO detainers, as compared with 3,623 in FY2016, as seen in Table 5. This is the greatest number of declined detainers over the last three fiscal years. The number of people attempting to sneak across the U.S. border with Mexico fell dramatically in the months following Trump’s inauguration, reducing the supply of easy-to-deport immigrants. And while the administration has directed ICE to ramp up enforcement, antipathy toward the president’s policies has supercharged the fundraising ability of advocacy groups and law firms that provide pro-bono help to immigrants fighting deportation. The additional arrests and litigation appear to be putting a new burden on the U.S. federal immigration court system, which faces a backlog of more than 600,000 cases. It may take years before immigrants arrested under Trump can be deported after exhausting their appeals. See the number of book-ins resulting from interior and border enforcement efforts across the past three fiscal years. Border enforcement book-ins dropped 25 percent in FY2017 compared to FY2016, while book-ins from ICE arrests increased 29 percent over that time. roughly two-thirds of the agency’s removals were immigrants picked up along the border, including many with existing deportation orders who were caught trying to sneak back in. 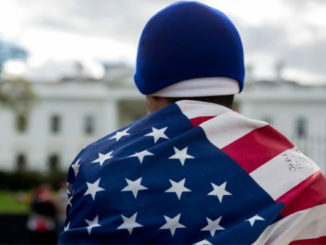 A removal is the compulsory and confirmed movement of an inadmissible or deportable alien out of the United States based on an order of removal. 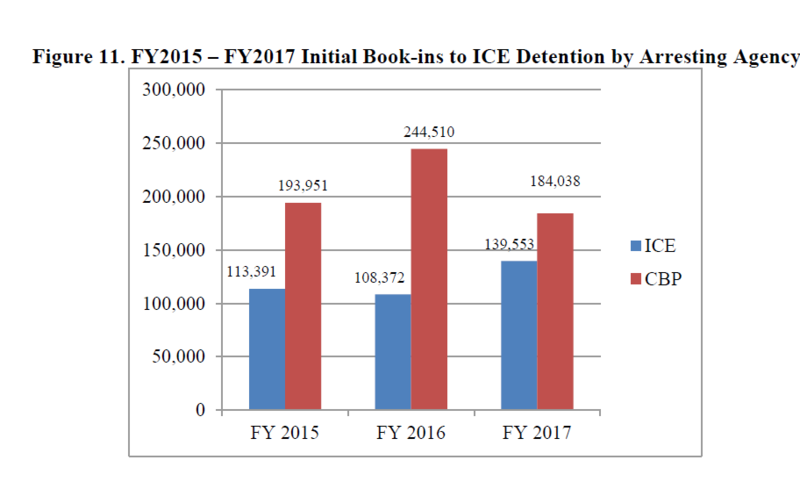 Similar to the trends of ERO administrative arrests and book-ins, removals tied to ICE arrests increased during FY2017, especially from the start of the new Administration. 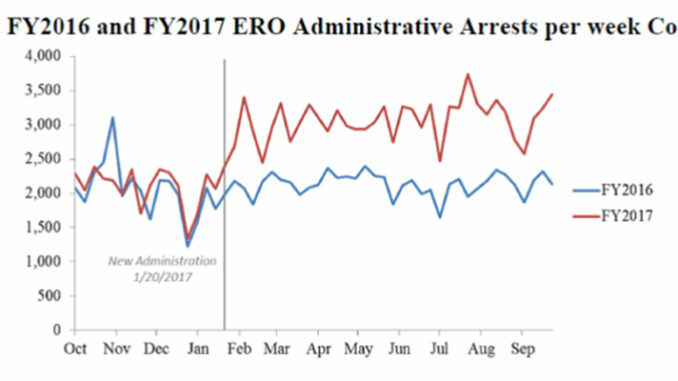 Figure 12 shows a 37 percent increase in removals tied to interior ERO arrests when comparing January 20, 2016 through end of FY2016 with the same time period in FY2017. Figure 13 shows the removals over the past three fiscal years as a result of an ICE arrest. 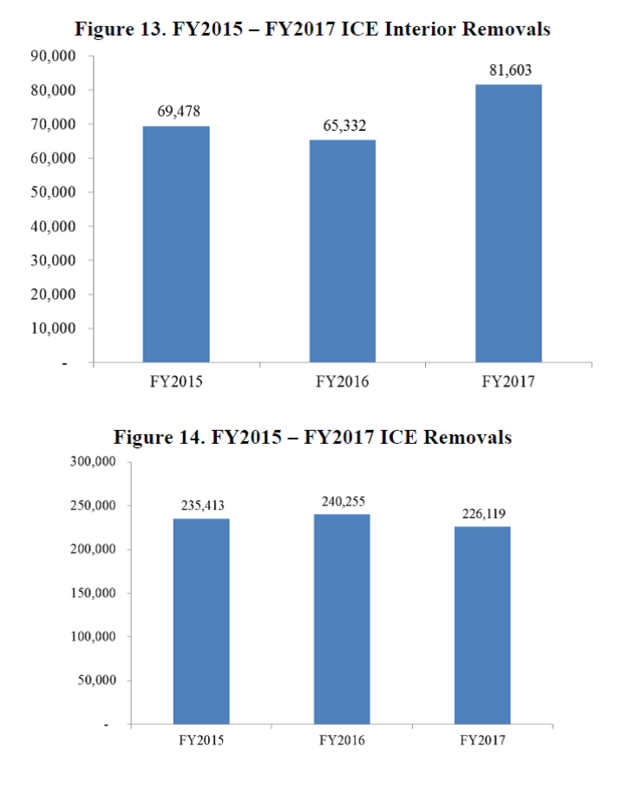 While total removals declined from 240,255 in FY2016 to 226,119 in FY2017, the proportion resulting from ICE arrests increased from 65,332, or 27 percent of total removals in FY2016 to 81,603, or 36 percent of total removals in FY2017. Despite the 6 percent decline in overall removals as shown in Figure 14, ICE removed 25 percent more aliens arrested during interior enforcement activities in FY2017 compared to the previous year. This surge in interior removals nearly offset the 17 percent decline in border removals, which mirrored the trend of fewer book-ins of border apprehensions. The decrease in ICE’s overall removal numbers from FY2016 to FY2017 was primarily due to the decline in border apprehensions in 2017. Many fewer aliens were apprehended at the border in FY2017 than in FY2016—possibly reflecting an increased deterrent effect from ICE’s stronger interior enforcement efforts. The drop in border apprehensions contributed to a decrease in total ICE-ERO removal numbers, as the majority of aliens arriving at the border are processed under the provisions of expedited removal and are removed quickly, while aliens arrested in the interior are more likely to have protracted immigration proceedings and appeals, which delays the issuance of an executable final order of removal. These cases also frequently require a more complex and lengthy process to obtain travel documents, further delaying the process. 4) The increase of law enforcement agencies refusing to honor detainers without (1) a properly completed Form I-200 (Warrant Criminality for Arrest of Alien) signed by a legally authorized immigration officer; or (2) a properly completed Form I-205 (Warrant of Removal/Deportation) signed by a legally authorized immigration officer.